news Telstra has launched a new Wi-Fi gateway for business, which it claims is the world’s first using Broadcom’s 4×4 Wi-Fi AC chipset. 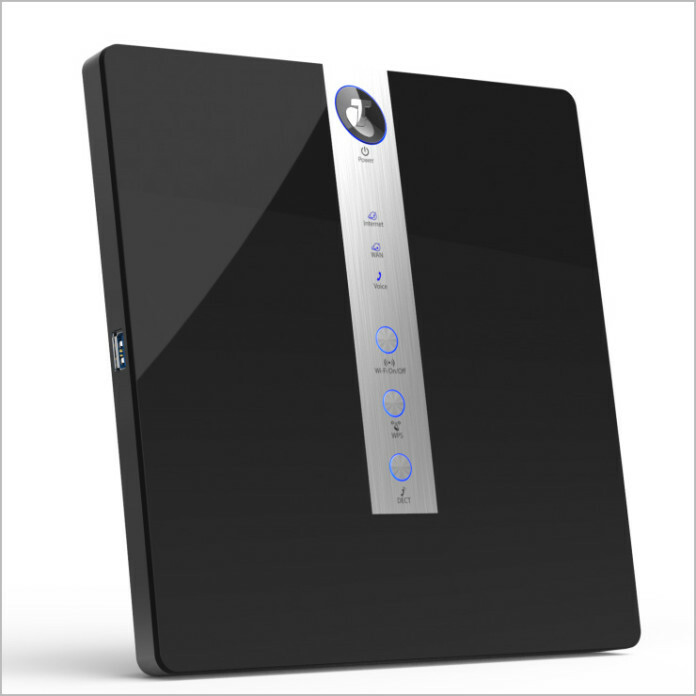 Developed in partnership with Netgear and Broadcom, the Telstra Gateway Pro is designed to enhance office connectivity, allowing more devices to connect at greater speeds than before, Telstra said in an online post. Netgear helped create the “appealing” design, Telstra said, with a clean-looking brushed-metal panel with less buttons on the front for “ease of use”, alongside a high-gloss black finish over the rest of the device. These specs mean that Wi-Fi speeds are to be up to six times faster on 5 GHz than Telstra’s existing business gateway, the firm claims. Reliability has also been improved, meaning users can connect more compatible devices and achieve high speeds simultaneously, while increased coverage provides top speeds more consistently across an office premises. Telstra said it tested the Gateway Pro in a “typical small office” to determine the level of coverage improvements that might be expected from the device. 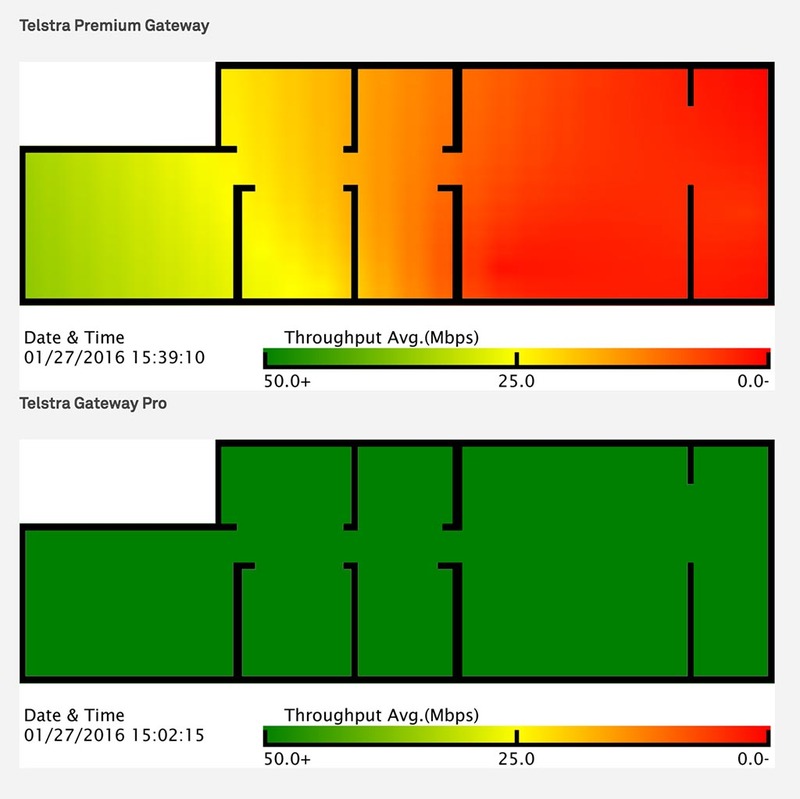 In the heat maps below, the image on the top shows coverage for the firm’s existing Premium Gateway, while the image on the bottom reveals the increased coverage and performance achievable under the same conditions for the Gateway Pro. Telstra stresses that testing was conducted in an “inner city Melbourne location”, with both the DEVG2020 Premium gateway and the 7610 Gateway Pro being set up as “default Telstra installs”. Testing was conducted over an hour for each gateway at the times indicated, the firm said, with multiple tests being conducted around the test location to measure both speed and coverage. The Gateway Pro is now available to Telstra’s ADSL, VDSL, NBN and Digital Office Technology customers. 50Mbps through put for an AC WiFi router is pretty poor imo – I get about 170Mbps thru a floor and a wall from our NetGear R7000 NightHawk router on 5Ghz to our 13″ rMBP. So how about listing the PRICE and ways to get it!? What an ABSOLUTE MARKETING SCAM AND CROCK. Wifi is a scam full stop. No amount of trickery will fix their faulty copper that is for sure. Wifi for businesses, get real. These are not business solutions and certainly not updated or secure either no doubt fully of Linux security holes. For your business you want an Edgemax router they are the business ! Do not buy into the Telstra con they are allowed to say it will boost their faulty copper NBN. AC is a joke just use ethernet already. You have a range of 1m pretty much. No amount of marketing fraud will stop noise, packet loss and stability even with repeaters that ironically need ethernet fed to them ! About time LiFi takes over perhaps ? and how will LiFi address the “Faulty copper” issue that you raised? Their wifi coverage picture looks like it was painted in Paint, literaly. Hey Smarty Pants…. The picture is from “Telstra Wi-Fi Maximiser” app, google it. Hmm, my Telstra Gateway Max (TG799vac) connects ~162Mbps (5Ghz band) to my smart TV which is 10 meters away in another room – great HD streaming!